I am passionate about oil painting. The process for me is one of discovery and I'm often unsure of how the final painting will look, allowing the process to evolve the work and reach a satisfying conclusion. As a landscape painter, working in oil paint with rural and coastal subjects forming the greater part of my work, I paint both inside the studio and outside 'en plein air'. 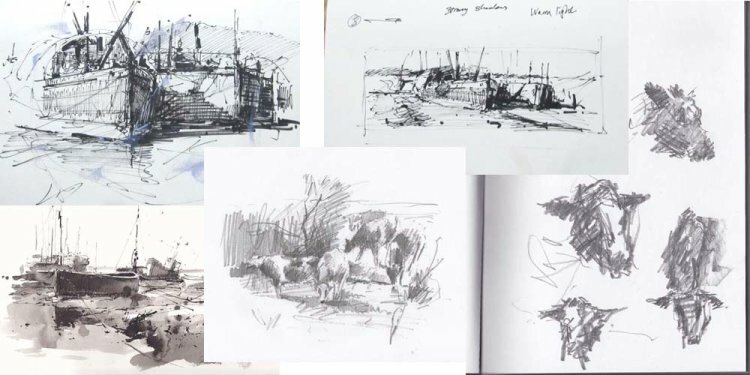 When I am outside my work varies from quick colour studies in oil, pen and ink studies and pencil notes to more resolved oil paintings. I sometimes make notes of little details of light effects, sounds and occurrences that all help to inform the painting process. I like my work to be about atmosphere. I am less interested in portraying an accurate account of the scene before me, instead opting to create a painting which encompass the highlights of my time immersed in the subject. Painting outside is a great way to capture a moment and an invaluable reference back in the studio although it has its own challenges. I usually work small and sketch to help etch the feeling of the subject in my mind and together with photographs and notes I can develop further, often larger work back in the studio. Working in the studio allows me greater time to consider the painting. It is possible to develop the moment that inspired me in the first instance and create a painting which is closer to my original experience. My process is to work through stages, each time refining, correcting and adjusting the painting. This way of working allows the painting to develop with energy and the brush marks made at each stage remain an important part of the final piece. I usually have several paintings on the go, working on one while another dries off a little bit. The time between sessions allows me to contemplate the painting and make adjustments to refine the work. A subtle shift in colour or tone is sometimes all it needs to call it complete.